0 request with some cookies set (nocookie IS NULL). This way of computing the offset undercounts the fresh sessions. While making sure we count only devices having made 1 request with no cookies set (nocookie IS NOT NULL) is correct, restricting the number by counting only devices having made 0 other request prevents counting devices whose "fresh" session includes more than 1 hit, about 10% of the offset. @JAllemandou Did the "about 10% of the offset" estimate in the task description refer to the daily metric? The correction that this bug is about affects only the "offset" of the unique devices calculation. Not the under_estimate (see definition of fix, it only affects fresh sessions). Seems that your graph above is plotting "underestimate+offset". If you want to see the effect of this bug best way would be graphing offset alone before and after correction for per-domain uniques. Daily or Monthly. The effect of bugfix on unique devices metric will depend of the percentage of the unique devices total that is derived from the offset. 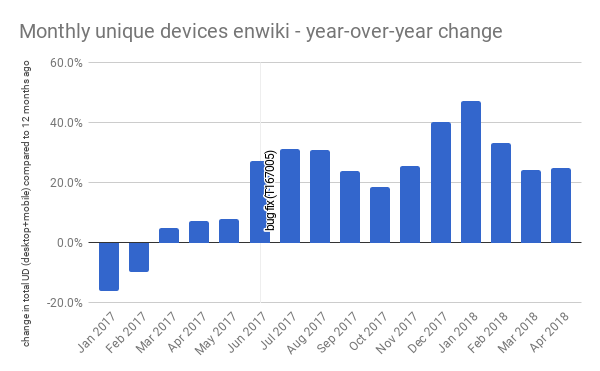 The offset correction represents a higher percentage of uniques the longer the timespan is so it is bigger for "monthly devices" that it is for "daily" ones. Well yes, I had already pointed that out above ("looking at the total uniques_estimate - haven't examined the offset part separately yet", my plot was about the overall metric because that happened to be the data at whose trends I was looking at). I have now made a plot: T169550#4729095 - seems it increased the monthly offset part on enwiki by about 60%.